Request a quote for a bulk order for H3K36me3 polyclonal antibody - Premium. Please fill out the form here below. Your local sales account manager will get in touch with you shortly and send you a quotation based on your requirements. Human, mouse, Arabidopsis, rice, wide range expected. * Please note that the optimal antibody amount per IP should be determined by the end-user. We recommend testing 0.5-5 µg per IP. 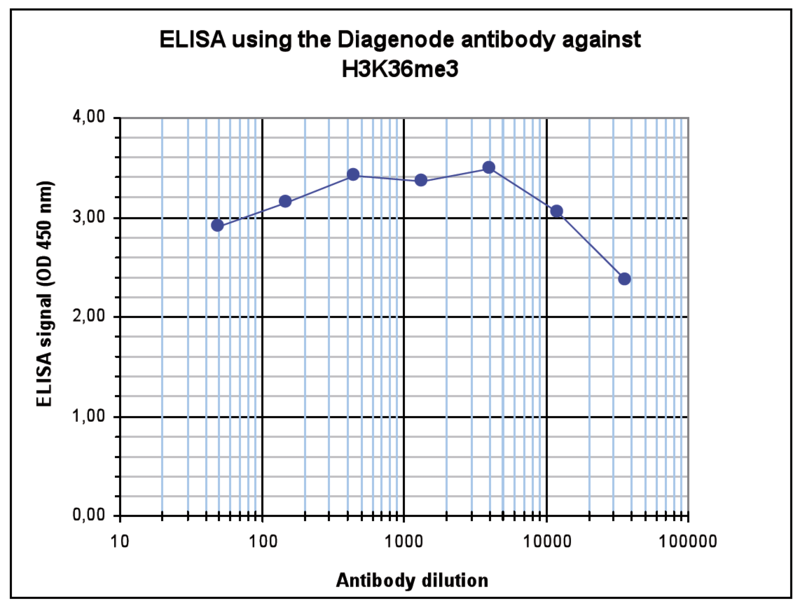 Figure 1A ChIP assays were performed using human HeLa cells, the Diagenode antibody against H3K36me3 (Cat. No. C15410192) and optimized PCR primer pairs for qPCR. ChIP was performed with the “Auto Histone ChIP-seq” kit (Cat. No. C01010022) on the IP-Star automated system, using sheared chromatin from 1,000,000 cells. A titration consisting of 1, 2, 5 and 10 μg of antibody per ChIP experiment was analyzed. IgG (2 μg/IP) was used as a negative IP control. Quantitative PCR was performed with primers for the coding region of the active GAPDH and ACTB genes, used as positive controls, and for the promoter and a region located 1 kb upstream of the promoter of the GAPDH gene, used as negative controls. 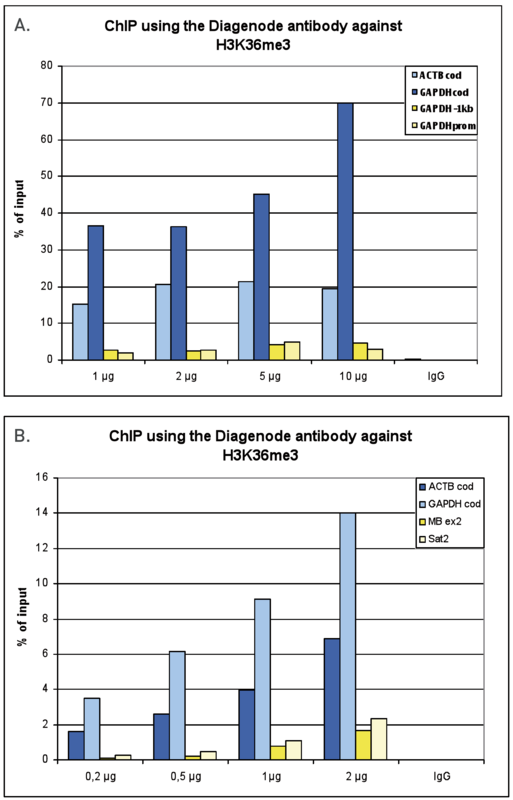 Figure 1B ChIP assays were performed using human K562 cells, the Diagenode antibody against H3K36me3 (Cat. No. C15410192) and optimized PCR primer pairs for qPCR. ChIP was performed with the “iDeal ChIP-seq” kit (Cat. No. C01010051), using sheared chromatin from 100,000 cells. A titration consisting of 0.2, 0.5, 1 and 2 μg of antibody per ChIP experiment was analyzed. IgG (1 μg/IP) was used as a negative IP control. Quantitative PCR was performed with primers for the coding region of the active GAPDH and ACTB genes, used as positive controls, and for the coding region of the inactive MB gene and the Sat satellite repeat, used as negative controls. Figure 1 shows the recovery, expressed as a % of input (the relative amount of immunoprecipitated DNA compared to input DNA after qPCR analysis). ChIP was performed on sheared chromatin from 100,000 K562 cells with the “iDeal ChIP-seq” kit (Cat. No. C01010051) using 0.5 μg of the Diagenode antibody against H3K36me3 (Cat. No. C15410192) as described above. The IP’d DNA was subsequently analysed on an Illumina Genome Analyzer. Library preparation, cluster generation and sequencing were performed according to the manufacturer’s instructions. The 36 bp tags were aligned to the human genome using the ELAND algorithm. 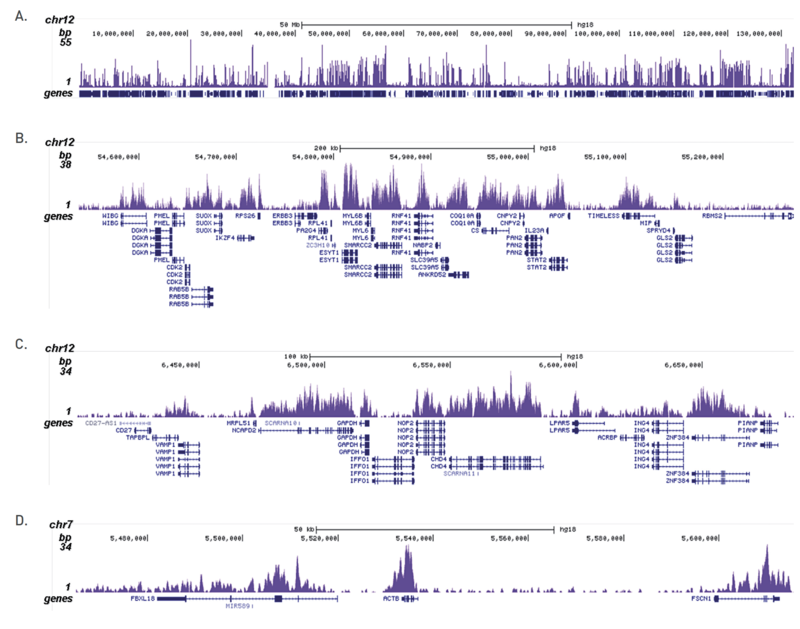 Figure 2 shows the H3K36me3 signal distribution along the complete sequence and a zoomin of human chromosome 12 (figure 2A and B) and in 2 genomic regions containing the GAPDH and ACTB positive control genes (figure 2C and D). To determine the titer of the antibody, an ELISA was performed using a serial dilution of the Diagenode antibody against H3K36me3 (Cat. No. C15410192). The antigen used was a peptide containing the histone modification of interest. By plotting the absorbance against the antibody dilution (Figure 3), the titer of the antibody was estimated to be 1:132,000. Figure 4A. To test the cross reactivity of the Diagenode antibody against H3K36me3 (Cat. No. C15410192), a Dot Blot analysis was performed with peptides containing other modifications or unmodified sequences of histone H3 and H4. One hundred to 0.2 pmol of the respective peptides were spotted on a membrane. The antibody was used at a dilution of 1:20,000. Figure 4A shows a high specificity of the antibody for the modification of interest. Figure 4B. The specificity of the antibody was further demonstrated by peptide array analyses on an array containing 384 peptides with different combinations of modifications from histone H3, H4, H2A and H2B. The antibody was used at a dilution of 1:10,000. Figure 4B shows the specificity factor, calculated as the ratio of the average intensity of all spots containing the mark, divided by the average intensity of all spots not containing the mark. 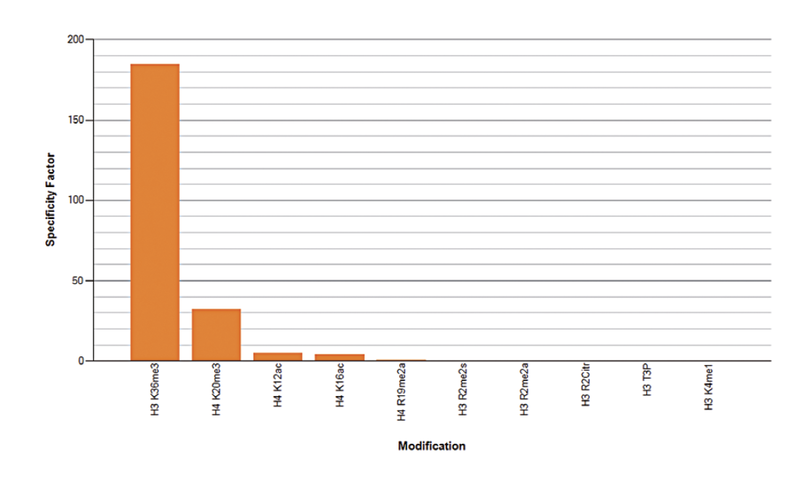 The peptide array analysis shows a slight cross reaction with H4K20me3 that was not observed in dot blot. 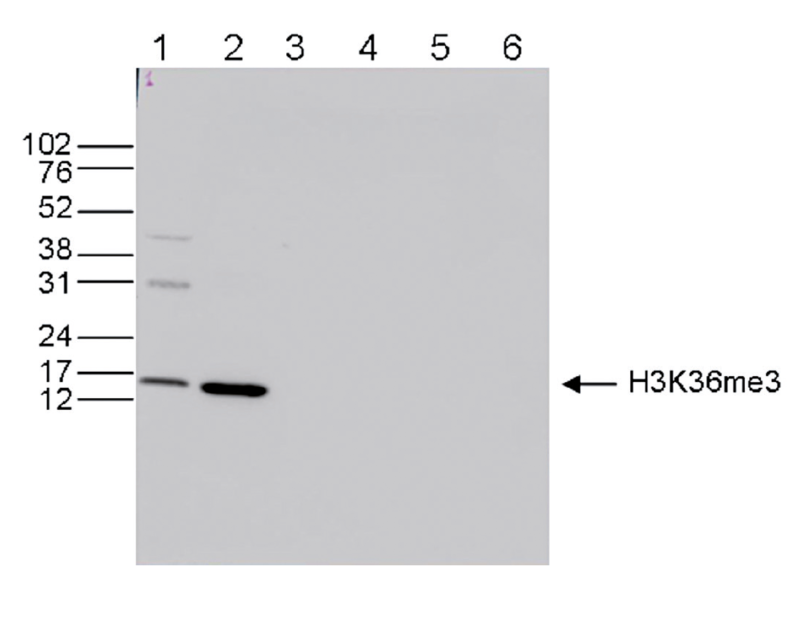 Western blot was performed on whole cell (25 μg, lane 1) and histone extracts (15 μg, lane 2) from HeLa cells, and on 1 μg of recombinant histone H2A, H2B, H3 and H4 (lane 3, 4, 5 and 6, respectively) using the Diagenode antibody against H3K36me3 (Cat. No. C15410192). The antibody was diluted 1:1,000 in TBS-Tween containing 5% skimmed milk. The position of the protein of interest is shown on the right, the marker (in kDa) is shown on the left. HeLa cells were stained with the Diagenode antibody against H3K36me3 (Cat. C15410192) and with DAPI. Cells were fixed with 4% formaldehyde for 10’ and blocked with PBS/TX-100 containing 5% normal goat serum and 1% BSA. The cells were immunofluorescently labeled with the H3K36me3 antibody (left) diluted 1:500 in blocking solution followed by an anti-rabbit antibody conjugated to Alexa488. The middle panel shows staining of the nuclei with DAPI. A merge of the two stainings is shown on the right. Diagenode strongly recommends using this:	H3K36me3 polyclonal antibody - Premium (Diagenode Cat# C15410192 Lot# A1845P). Click here to copy to clipboard.